The deck begins with a very strong host of early-game critters which are largely decent draws even later in the game. Kor Duelist is a bit weak, but makes for a good synergy with the Equipment subtheme in the deck. It is optimised when equipped with the Trusty Machete, becoming a 3/3 double-sriker (no mean feat for a one-drop), and if you’re looking to tweak the deck the first two cuts are the Explorer’s Scope and Spidersilk Net in deference to more power-increasing Artifacts. A brace of Kor Aeronauts and Kor Skyfishers lend the deck its air force at the two-drop slot, with the Skyfishers getting the slight nod for being the better card. With the deck so aggressively costed, even a turn-2 Skyfisher (returning a Plains to hand) isn’t out of the realm of possibility (with a somewhat agreeable hand, of course). The Aeronaut’s Kicker is useful for getting in some extra damage, but once used is more or less done. One of the deck’s two Rares is also in this slot- the Armament Master. The Master is a natural fit for this heavily tribal deck, and at worst is just a Bear (a 2/2 for two). Even just one piece of Equipment attached to him can turn the fortunes of war, and a Stoneforge Mystic would be a natural add for any tinkerer looking to use this deck as a base. Next we have a pair of Kor Sanctifiers, whose Kicker is conditional but very strong (and can only get better as we enter an Artifact-heavy environment with Scars of Mirrodin), and a matched pair of Kor Hookmasters. The Hookmaster’s ability may seem minor at first, but is not to be dismissed. The mid-game is where things often begin to go South for a Weenie-swarm strategy, as 3/3’s and 4/4’s start to take over the red zone and it becomes harder to get in those last few points of damage. The Hookmaster’s tap ability (which lasts two rounds, mind) is a simple and efficient answer to extending the shelf life of your non-evasive beaters just a little longer. The duds of the deck, sadly, are the pair of Kor Cartographers. It’s hard to justify the inclusion of these two in the deck other than the fact that they’re Kor. Essentially, you’re paying four mana for a 2/2 body and a Plains. Creatures that fetch lands can often be tremendously useful- either they enable mana ramp (getting mana out faster), colour fixing (making sure you have the right kinds of mana out in a multi-colour deck), or both. But Kor Armory is a mono-colour deck- no fixing is needed. By the time you can cast the Cartographer, you’re already able to cast almost everything else in your hand, so the value of mid-game ramp is questionable. 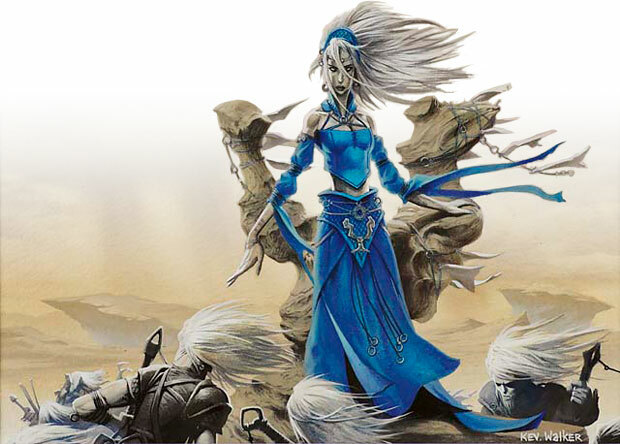 All could be forgiven, of course, if the deck had a number of Landfall-enabled creatures that would delight in another land being played, but the deck doesn’t pack a single one. And Kickers? Are there enough cards here with expensive Kickers that we’d like to see come on-line sooner? 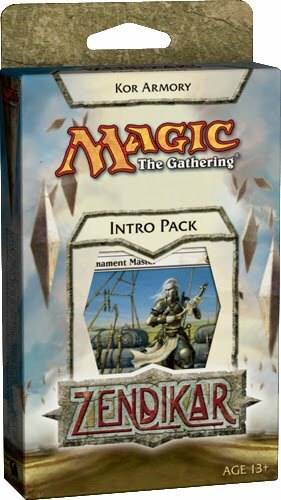 Nope- every Kicker card in the deck can be paid with Kicker for four or less mana, except one that you’ll almost never be casting Kicked anyway (Conqueror’s Pledge). So why the Cartographers, then? One possibility is that it was thought a dose of ramp would help on turn 5 to enable the casting of a couple creatures, and while this is correct it still seems like an underperformer. We’d much rather have two more Kor Hookmasters in the deck than the two Cartographers, as they’ll add much more threat density than a fetch-Plains would. Even in a 41-card deck (which Armory is), improving draw quality by weeding out a Plains or two will have negligible benefit. The same, however, cannot be said for the top-of-curve Serra Angel. This classic icon of the game finds a good home here as a closer, adding an evasive threat that also can keep an opponent’s offense off-balance. There’s not much new that can be said about a card that’s been around since the dawn of the game, but she gets a definite thumb’s up here. Of course, a Swarm strategy is only as good as the spells it has to support it, for a horde of smaller creatures can seldom ‘get there’ entirely on their own. Sadly for our intrepid Kor, Armory packs something of a mixed bag here, in contrast to the mostly solid Creature selection. In the 0-1 cost range we find our three pieces of Equipment. Only the Trusty Machete shines here, the Spidersilk Net is too defensive-minded and the Explorer’s Scope– while fun- only becomes fully optimised in a Landfall deck. Still, with the ancillary benefits related to the Kor Duelist and Armament Master, they’re not bad choices, just ones easily upgraded. From there we have a rather threadbare removal suite: two Pacifisms and a Divine Verdict. These are all solid choices, the shortcoming lies only in that there are so very few of them. That creates a certain tension in the deck: with so little removal you’ll want to save it for their best creatures, but the deck’s strategy pushes you to clear out potential defensive roadblocks as fast as you can so as not to lose too much momentum. This is definitely a misstep here. As for the rest of the spells, they’re somewhat underwhelming. Windborne Charge is a decent closer to finish off a wounded opponent, and Conqueror’s Pledge can turn the tide of battle (especially when you’ve got your Armament Master equipped), but we could have easily done without Narrow Escape and the poor Landbind Ritual. While two life per Plains may sound tempting, by the time you’re able to cast it most games should be in a state where you’re life total doesn’t matter so much (you’re either already winning, or just prolonging the inevitable). So there you have it, a gamble of a deck that packs in some solid Creature consturction with flawed and shaky spell support. This indicates the need to go in hard and fast, and may even necessitate a little luck if you start getting bogged down in the middle (see: Kraken Hatchling, for instance). Join us next time when we go into the field behind the deck, and see if it’s able to get the job done. Pretty surprising to me that Adventurer’s Gear didn’t make it into the deck. That was always a great limited combo with Kor Duelist. The equipment theme makes it a good precon to mash up with some Scars of Mirrodin cards. I’d tend to agree with troacctid. The deck as it stands is not great, but where it shines is in having a great deal of potential. Add in a few better equipment, trade out the Cartographers for more Duelists or Hookmasters (or better yet, if rares are no concern, more Armament Masters), and some removal, and you have a deck that’s very well placed to take advantage of the artifact-heavy environment that seems to be approaching. Kor Sanctifiers should prove its worth twice over. I would be inclined to tweak it to add a little late-game strength. The one Serra Angel is good, but to keep the tribal theme, I might replace her with one or two copies of Armored Ascension: it turns an ordinary Kor into a potential late-game threat, and certainly fits Zendikar’s ‘land matters’ theme. I’d also like some way to protect my Kor from removal, or have a way to sneak them past blockers like the Kraken Hatchling you mention; Brave the Elements would allow some protection/evasion for the army on the ground. 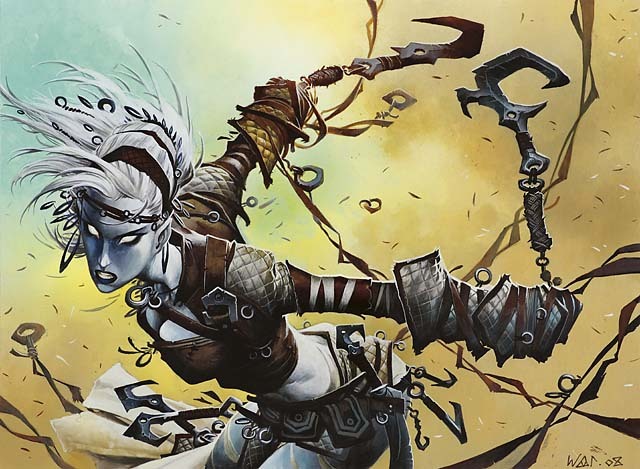 …I would not go so far as to say that Kor Armory is bad, but even just looking at Zendikar commons and uncommons, it is a deck that begs to be tinkered with. I’d never heard of Kor Armory until this article. Its good to see Serra Angel in this deck. While it doesn’t share a tribal theme, I feel it does add to the weenie swarm strategy. As far as the Cartographers… 4 mana for a 2/2? WTF? Take em out. I actually don’t like Serra Angel here. Five-mana creatures don’t fit very well with the weenie theme of the deck. I’d rather have another equipment, Conqueror’s Pledge, or just another copy of one of the better Kor. * Serra Angel: Although neither Kor nor soldier and besides out of the Weenie cost range, I have always liked him (her?) as a solid striker. Thus having the Angel in this deck fits well for me. * Armament Master: I am really into the solder/equipment theme, but imho the Mirrodin set has a better support for it than Zendikar. Although … if some interblock exchange is allowed in the casual group you’re all playing in, I deeply recommend the most loved Auriok Steelshaper.